Daisy has manufactured guns of various types for over 100 years. When the company began operations in Plymouth, Michigan, circa 1882, they were known as the Plymouth Iron Windmill Company. However, by the late 1880's there wasn't much demand for windmills and the company began looking for new ways to attract customers. In 1888, Clarence Hamilton (founder of the Plymouth Iron Windmill Company) brought the prototype for his new air rifle to the board of directors. Lewis Cass Hough (president of the firm) fired the gun and after his first shot exclaimed, "Boy, that's a daisy! ", or words to that effect. The name stuck, and it is rumored that the bb gun went into production as a premium item given to farmers when they purchased a windmill. The gun was such a huge success that Plymouth Iron Windmill began manufacturing the Daisy bb gun in place of windmills in 1889. On January 26, 1895 the board of directors officially voted to change the name of the company to Daisy Manufacturing Company, Inc.
off of Buck Rogers 25th Century Pop Guns. steel was no longer available for domestic production use. During the war Daisy made 37mm canisters for the war effort and two models of wooden toy guns, the Chattermatic and the Commando. 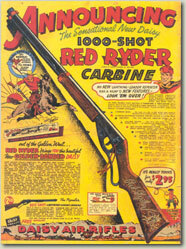 Many pre-war models of Daisy bb guns were never produced after the war, but led by their most famous model (the Red Ryder), Daisy came back to full production in 1947. In 1958 Daisy relocated its manufacturing facility from Plymouth, Michigan to Rogers, Arkansas. My family packed up and headed for Arkansas, where my father became the company's new Production Manager. After establishing operations in Rogers, Daisy expanded its product line to include CO2 guns, pellet guns, .22 caliber firearms and most recently, paintball guns. In 1961 Daisy hit another milestone with the introduction of their "Spitten Image" line of bb guns. Leading the way and becoming Daisy's number one seller was the Model 1894 "Spitten Image" of the Model 94 Winchester. This gun even outsold the famous Red Ryder Carbine. Over the years, Daisy has manufactured nearly 100 different models of toy guns and nearly 400 different models of bb and pellet guns. They made their first firearm in 1968 which fired a "Caseless Ammunition" round. It was called the VL0001 and was fired with a revolutionary type of propellant, similar to rocket fuel. The ammunition was developed by a Belgian petrochemist by the name of Jules Van Langenhoven. Thus the model designation "VL". The gun went out of production in 1969. In 1990 Daisy began manufacturing their "Legacy" line of conventional .22 caliber firearms. There were a total of six models, including: two single shot rifles, two bolt action rifles and two semi-automatic rifles. Three had copolymer stocks and three had hardwood stocks. This firearm, like the "VL", was short lived. Today, Daisy (now known as Daisy Outdoor Products) focuses on manufacturing toy guns, bb and pellet guns, airsoft guns, paintball guns and accessories. Their general offices and museum are still located in Rogers, Arkansas, but their assembly operations have been moved to Neosho, Missouri. To visit the Daisy website, click here. To visit the Daisy Museum website, click here.